Website: Purchase $15 tickets here. 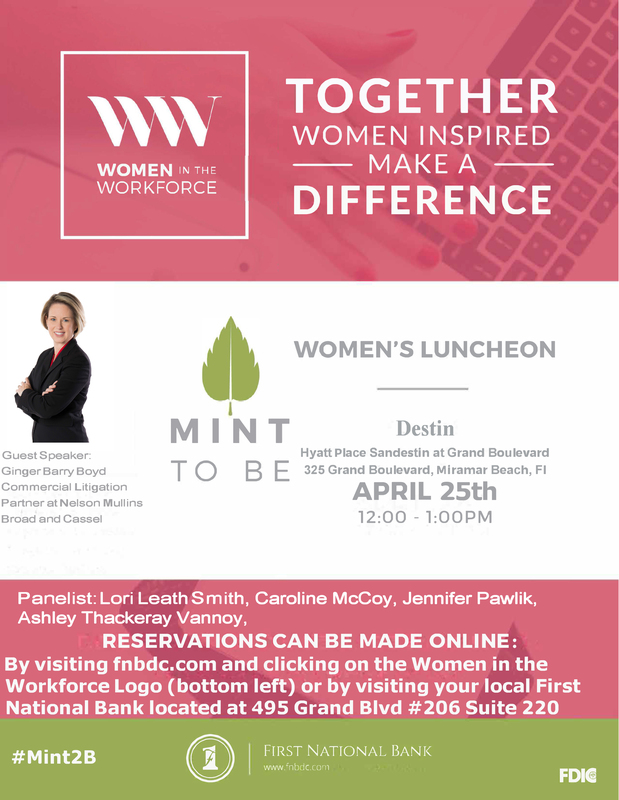 First National Bank Presents: 2019 Women in the Workforce Luncheon on April 25, 2019 at Hyatt Place Sandestin at Grand Boulevard located at 325 Grand Boulevard, Miramar Beach, FL. First National Bank's hope is that all current and former working women will come and enjoy a catered lunch, hear from a designated panel of four influential business women in our community as well as a keynote speaker and even leave with a door prize or two. These women while from different industries and professions will openly discuss the challenges and blessings of being a Woman in The Workforce. Our hope is that participants will leave inspired, motivated and hopefully be encouraged as these women share their own struggle of conquering the workplace while maintaining a positive balance at home.